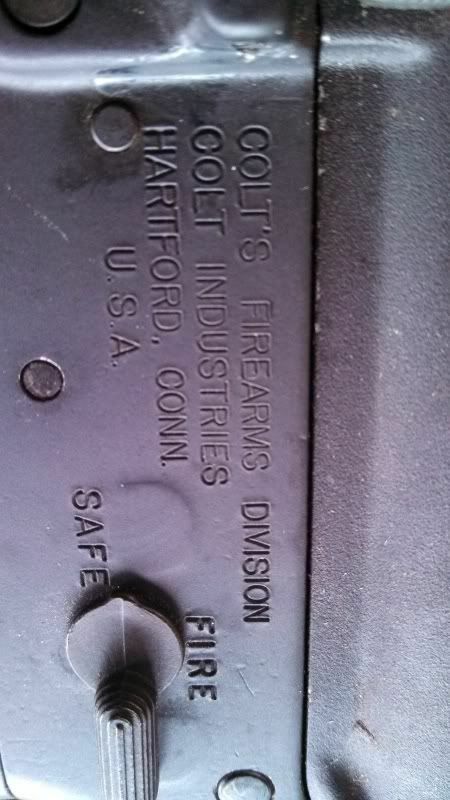 [ARCHIVED THREAD] - New member to forum,& new owner of a DPMS. Oh, man. Have you come to the wrong place for this advice! First, welcome to the forum! All are welcome. But you've stumbled into the "retro" forum, where we have an unflinching, manly love for the early AR15 design of Eugene Stoner and company. Around here, we believe an SP1 is a thing of simplicity and beauty just the way she left the factory, and anyone who would deface her with atrocious non-necessities like a quad rail forearm should be pummeled with carbon steel gas tubes until they see the light! This forum is dedicated to "A1" and earlier ARs, with a strong focus on the models of the Vietnam era. Stick around, get to know us, and give us a chance to change your opinion of that simple, lightweight rifle you already own! the only optic that it was designed for was a carry handle mounted scope and the bipod was a clamp on one. once you get your dpms, you can go all tacticool on that one. Welcome to retroland. You will thank everyone down the road for advising to keep SP-1 just as it is with the only upgrades being period correct accessories. 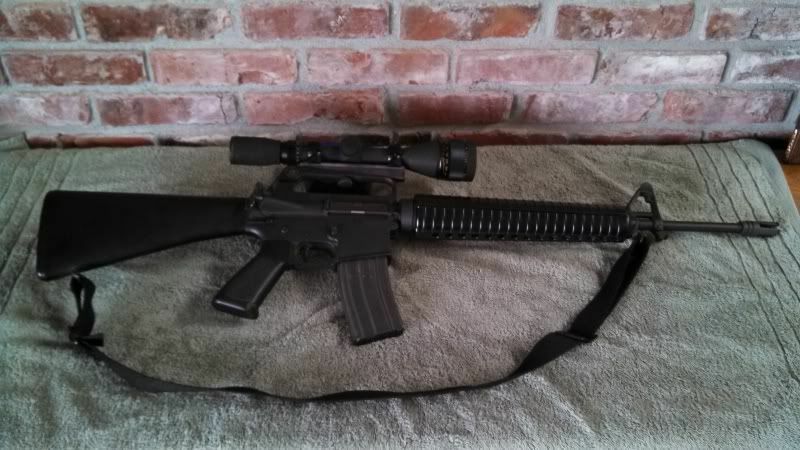 a Colt SP-1 AR-15 full size rifle.I'll eventually add a few mods to it. I bet that if you wanted a rifle to add mods to, you could sell or trade that beautiful original rifle to someone here that would appreciate it for what it already is, and what it isnt. When Retro Black Rifle Disease sets in and you can't find your slip ring to put it back to its original form you're going to be sorry. You will also remember this thread and say, "I should have listened!" Nothing wrong with the DPMS. But if you're going to modify anything please consider the new rifle as a candidate. The SP1 is a classic. "I will have corn rows in the last week of august due to work constraints." - NYC-M4...Lest we forget. Triangular handguards are cheap and plentiful. Look up boywonder on the Equipment Exchange, beat up handguards cost pocket change, and nice ones are only a few bucks more. Edit: Click here for parts goodness. Just from the pic those A-2 HG's look in nice shape and appear to be USGI nice and shiney examples. Nice looking rifle. Probably a little heavy with a loaded drum. Pick up a nice set of A-1 Hg's to complement rifle when chance occurs at a decent price. Try and get a NOS, finish matching set if spending over $30. Armysurpluswarehouse still has NOS right side only triangle Hg's for $2.49ea if bargain shopping since member Boywonder has been mentioned. Also member Jhud has had them in the past. Sir Plus also had NOS HG's but haven't checked recently. You've got a Lonestar Stow-A-Way pistol grip on there. Someone doing an Izzy clone would swap you an original A1 grip for it, I am sure. Looks like an A1 upper with A2 handguards and a Vortex (?) flash hider. Run away before you catch brd there is no cure. Yep, you may want to get an original PG, HGs, FH, Sling, 3X20 scope... Feeling light headed or feverish yet? Looks like I found me a 601 upper rec... ! pistol grip. What you have is an aftermarket A1~ish style. Hello MAXIMUS79. Your SP1 may not be too far off from "correct." What markings are on the barrel? The upper receiver is A1 but looks like it has a little texture in it, it could be refinished. Also, are there any forge codes on the right side of the carry handle? ("CK" or "CH") Can you tell us what markings are on the bolt + carrier / show us pictures. 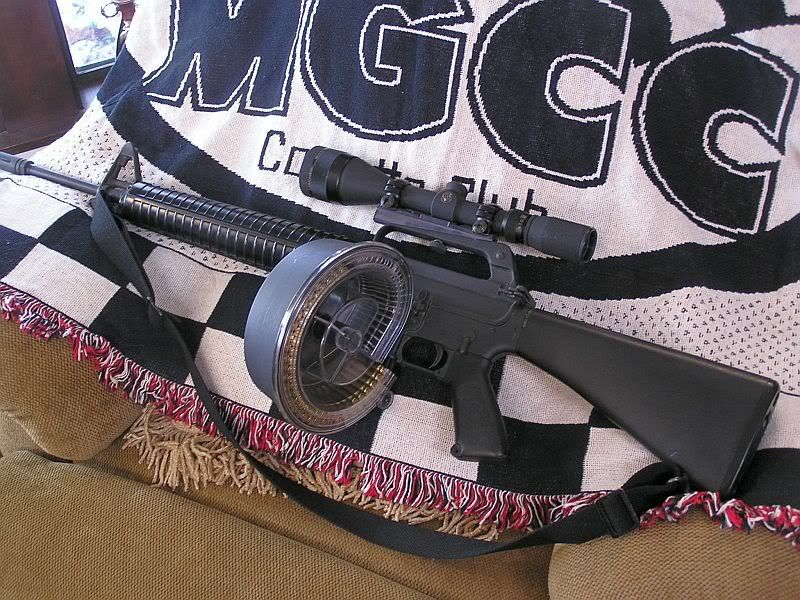 FCG components are unique to SP1s too, hand guards look like old shiny Colt and A2 fans seem to like them. 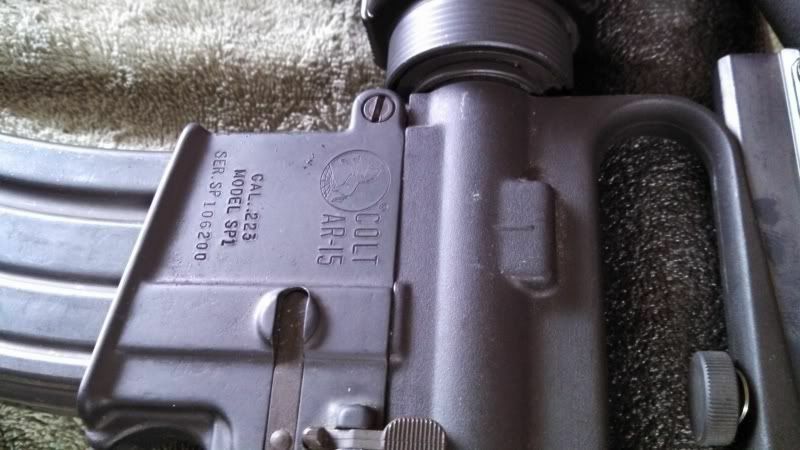 The DPMS should work fine.